AFTER a week off for fitness testing, Round 2 of the NAB League Girls competition is raring to go, with all 12 sides ready for another big weekend of footy. In what is looking to be another hot match for both sides, the Bendigo Pioneers will host the Eastern Ranges to start Round 2. For Bendigo, Maeve Tupper and Eloise Gretgrix were among the best in the narrow loss to Greater Western Victoria (GWV) Rebels in Round 1, holding down the midfield and creating issues downfield. Gretgrix’ consistency and ability in one-on-one contests will prove difficult for the Ranges if not addressed. Eastern are coming off a good win against the Stingrays, but will be rueing missed opportunities in front of goal so will want to really make their mark against the Pioneers with accuracy key. Olivia Meagher and Tarni Brown stood up in the win, impressing through the midfield with their efficient ball movement and pressure around stoppages, so will want to come into this second match with confidence against a side that pushed the Rebels all the way last round. The second game for Round 2 will see GWV Rebels host the Calder Cannons in a battle for a second win. With five goalkickers in Round 1, Calder have shown they have plenty of options around the ground to bring into the game at any given time, while the Rebels showed great composure to come away with a win against a pressurised Pioneers side last round. With only two named in the Draft Central Team of the Week – Makeisha Muller and Georgie Prespakis – despite a dominant win, Calder have a lot to prove coming into this round. Muller showcased her skill with the footy last round, with an intuitive snap on goal a highlight of her Round 1 output, making her a difficult player to take on around the ball. Dominant ball carrier, Georgia Patrikios has been named in the side this week on the interchange, so will be a key player regardless of her role on the field, and will pair nicely with Prespakis to build up the Cannons’ midfield. Meanwhile, GWV Rebels will come into this game also with a Round 1 win under their belt, and two standout players in Nekaela Butler and Isabella Simmons. Simmons kicked two goals and showed some good footy smarts downfield against the Pioneers last round, so will want to bump up her work ethic against the Cannons for a four quarter effort. Defensively, Butler and Nyakoat Dojiok will have their work cut out for them down back, but with their combined speed off the half-back, they will be key players on a mission to cut off Calder’s dominant goal kickers. The third game of Round 2 will see Northern Knights host the Oakleigh Chargers, with both sides sitting toward the top of the ladder after dominant Round 1 performances. 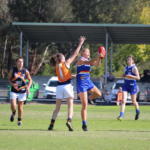 Oakleigh key forward, Emily Harley kicked four goals against Gippsland Power, staking her claim as a leading goalkicker of the competition early, while fellow forward, Northern’s Britney Gutknecht, kicked four majors of her own on her side’s way to dominating Murray. With four Knights midfielders who made the Draft Central Team of the Week last round, Northern will be a challenge to combat when in possession, especially with the confidence boost of rendering Murray goalless in Round 1. Amelia van Oosterwjick kicked two majors to add to the Chargers’ tally last round, showing her value as a second tall inside 50 while midfielder, Gemma Lagioia showed her effectiveness with ball in hand on the outside, with silky precision proving she will be a difficult player to take on. Northern’s Ellie McKenzie used her clean ball movement and awareness on field to create opportunities for clearances last round, so is likely to come into this matchup with a similar process. The reigning premiers will host Gippsland Power to open Sunday’s fixture, and will come into this matchup confident after an excellent 26 point win against the Sandringham Dragons in Round 1. Gippsland went down by a frustrating 50 points in the first round, meaning they will really have to lift their game to get over the line this week against the Falcons. 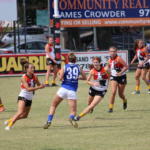 Falcons’ Round 1 best on ground Luka Lesosky-Hay and Lucy McEvoy proved dominant through the midfield, pairing well and contesting the ball at every opportunity, making it difficult for opposition movement, so will want to storm through Gippsland this week to continue their successful start to the season. Gippsland’s Chandra Abraham put on a show with her tackling pressure last round and defensively was a great backup to her side, so will want to back up her Round 1 performance and prove her effectiveness when her side faces off against Geelong’s efficient and dominant midfield. 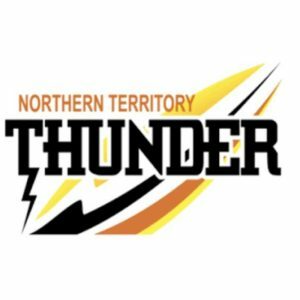 Two more sides face off in their campaign for a debut win for the season, with Murray hosting Western after a disappointing Round 1 matchup against 2018 grand finalists, Northern. Murray only managed to score two behinds for the game, but showed some promise with midfielders, Abby Favell and Ally Morphett standing up through the tough match, while Olivia Barber also put in the hard yards. Their determination and relentless effort will bring a lot to the side this week when they take on the Jets, who are also coming off a Round 1 loss to Calder. The Jets will look to last round’s best on ground, Isabella Grant and Elisabeth Georgostathis to get their side on the board, with Grant kicking the side’s only goal in Round 1. Georgostathis is another player who doesn’t back down from contests, so will be a key player when it comes to breaking through Murray’s midfield. The final matchup of Round 2 will see the Sandringham Dragons host the Dandenong Stingrays at the revised starting time of 1pm. Both sides are chasing their first win for the season, with Dandenong coming out of Round 1 with a tight loss to Eastern, while Sandringham were beaten by reigning premiers, Geelong. Sandringham captain, Molly Denahy-Moloney is a late omission from the match with illness, meaning the side will need to push hard in the forward 50 for scoring opportunities. Sarah Hartwig had a fantastic match against Falcon, Lucy McEvoy in Round 1, so will want to replicate her efforts coming off half back to produce ball movement toward forward 50. For Dandenong, Brooke Vernon showed her strength in the backline and was dominant as the last line of defence in Round 1, so will be one to look out for when it comes to goal scoring opportunities for the Dragons. She paired well with Zoe Hill, also named in the Stingrays’ best, and the duo will certainly be ready for any forward action for Sandringham.